"Elevate your traditional menorah with this beautiful, polished silvertone design." "These honey-scented beeswax options are hand-rolled and sit 4.5" high...while giving off a pretty scent in the process." "With over 120 recipes using the signature tastes of Jerusalem, you’ll find everything from hearty vegetable dishes to decadent desserts." "Kosher-certified and made in a nut-free facility, you can still expect the best taste and flavors in this premium Belgian-made chocolate." "Made with both style and durability, it’s the perfect gift for cousins, grandparents, or friends alike." 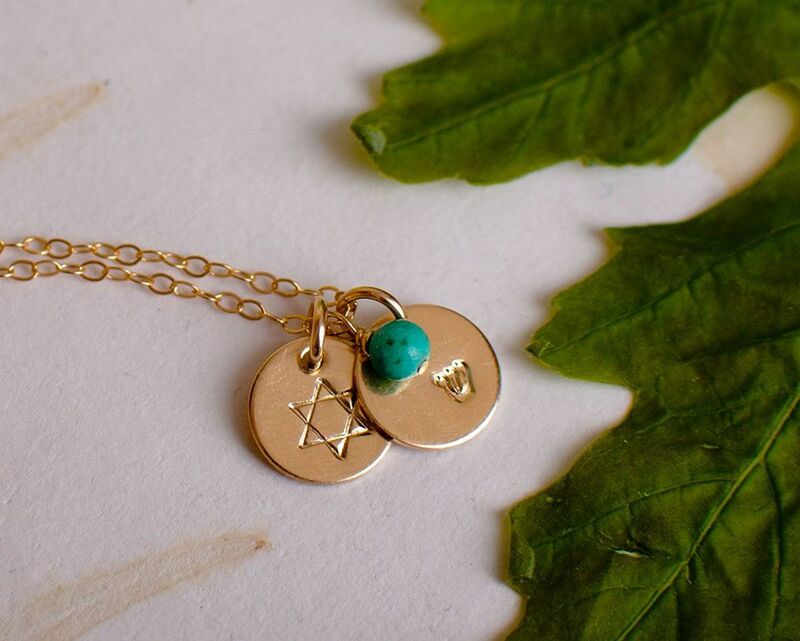 This personalized necklace comes complete with the traditional Star of David with options to add your initial and birthstone beside it. "Set contains a 9-inch, high-quality plush Maccabee warrior toy...with a beautifully illustrated book." "The main character in this book provides a refreshing take on frugality." "These spill-proof stemless wine glasses are an easy way to keep the celebration going." "Made with a stylish Alligator print in a metal or matte finish, it’s the perfect way to showcase your latest app or cocktail creation." "With hands-free voice control, all you have to do is ask for your favorite artist or song for background tunes for the night." Elevate your traditional menorah with this beautiful, polished silvertone design. Declared a best-seller in its class, it’s made from a die-cast cut to make this Menorah more durable and one that can be enjoyed for years to come! Paired with a picturesque silver finish and all you need is a special set of candles to complete what’s bound to be an elegant and special celebration. Lucky for you, we found a top-rated candle pick perfect for your menorah! These honey-scented beeswax options are hand-rolled and sit 4.5 inches high, so they’re bound to fit your centerpiece while giving off a pretty scent in the process. Plus they stay well lit for up to an hour, so the fun doesn’t have to end early. With a variety of cool colors to choose from, these are guaranteed to be a hit at your gathering. Time to cue the lights! Enjoy the tradition of exchanging little sacks of gold coins with family and friends for Hanukkah. Kosher-certified and made in a nut-free facility, you can still expect the best taste and flavors in this premium Belgian-made chocolate. Customers rave about their decadent taste and mouth-watering properties that run better than any store-bought kind. Not convinced? Then these bags of chocolate coins are worth a taste yourself! Make sure you have a special place to store all your memories in the making. This classic and chic picture frame is the perfect accessory to show them off! Whether in the living room, bedroom, or office, your magical holiday moments will be highlighted for all to see. Made with both style and durability, it’s the perfect gift for cousins, grandparents, or friends alike. It even works great as a take-home gift, too! Take the spirit of the holiday with you even after the festivities end. This personalized necklace comes complete with the traditional Star of David, with options to add your initial and birthstone beside it. The 14-karat gold filled chain and pendant make this necklace even more luxe for the special recipient in your life. Bonus: There’s a 15% discount for buying five or more of these jewelry pieces, so we highly encourage grabbing a few for all those you love. Create new traditions in your household with a set that instills the meaning of the season among the little ones. This Maccabee Hanukkah Gift Set contains a 9" high-quality plush Maccabee warrior toy meant to be held, snuggled, and played with throughout story time — and the entire season. It also comes with a beautifully illustrated book to tell the true meaning behind the celebration of Hanukkah. Complete with a custom 3" wooden dreidel and game board, it’s one present that’s sure to bring meaning and joy to its lucky recipient. In today's world filled with disposable things, the main character in this book provides a refreshing take on frugality. Based on a Yiddish song from the author’s childhood, the novel is covered in poetic verbiage and imagery that can be appreciated by readers of all ages. Enjoy striking illustrations created with watercolor, pencil, and ink alike that narrate the important moral lessons behind Joseph and his ever changing overcoat. Another bestseller worth raising a glass to. When the conversation begins flowing around the table, ensure a little spill doesn’t ruin all of the fun. These spill-proof stemless wine glasses are an easy way to keep the celebration going no matter what incremental situation arises. Since they’re dishwasher safe, the post-party clean-up will a breeze, too, making them just the addition you need for all eight nights of entertaining. Speaking of entertaining guests, here’s a tray that’ll take your serving skills up a notch. Made with a stylish Alligator print in a metal or matte finish, it’s the perfect way to showcase your latest app or cocktail creation in one easy delivery. Complete with durable polypropylene and handles for easy serving, you can focus on the real purpose of the party — the fabulous company! The Amazon Echo Dot will be the little helper you need to pull off the perfect evening. With hands-free voice control, all you have to do is ask for your favorite artist or song for background tunes for the night. With access to top music-streaming services like Pandora, Spotify, iHeartRadio, and TuneIn, you’ll have everything you need to fill your room with the music you love. And since the Echo is Bluetooth-enabled, you can also stream other popular services like iTunes from your personal phone or tablet. Either option you go with, it’s bound to be the best way to soundtrack your Hanukkah celebration.